This is how you take up social issues, make them a part of your brand story and stay relevant. 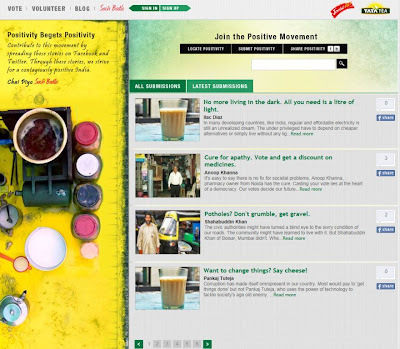 TATA Tea’s Jaago Re (Wake Up) campaign has built quite an equity over the years. The latest from them is Soch Badlo (Change your thinking). The idea of sharing Positive Stories for a Positive India resonates deeply with the times we are living in today where it is very easy to give in to cynicism. Essentially a simple story submission campaign, the interface is layered with Social Media integrations. Users can submit stories, share and comment on them via Facebook & Twitter integrations, as a pot of tea comes to a boil. The site also has links to various other Jaagore initiatives. There is a Jaagore Blog which has consistent posts. Users can also offer their time for causes via the deep Volunteer section that lists NGOs & Groups and has deep content around issues. I really like the creative rendition on this section with the comic strip representation. A couple of points on execution and UI. The htmls need a QC as some of the pages render incorrectly, specially the blog. It would also be a good idea to cross link pages via a common navigation so that users can jump around content rather than losing their way and opening multiple pages. Small blips, in an otherwise superb initiative.